Not in photos: S/Sgt John P. Moody - complained of severe pain in ear - possible perforated ear drums. 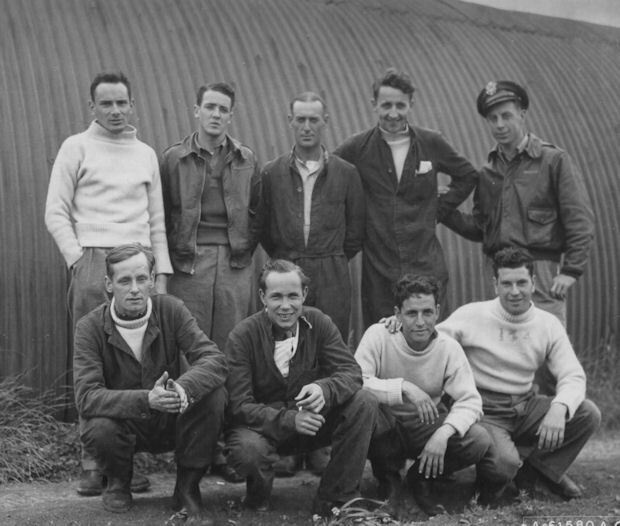 All crewmen completed their tours of 25 missions. Americans put up a huge formation of B17's on Bastille Day to bomb a target in France, which undoubtedly was also designed to show the flag, and lift the morale of the French. My memory tells me a ball bearing factory, and perhaps Le Mans. At any rate it was a fairly massive attack for those times. Our Squadron was briefed for "Withdrawal Cover" in the Le Havre-Caen area, which entailed taking up position there to await the bomber force on its return, and give any assistance that may be required. We patrolled about for some time in company with a number of other Fighter Squadrons and eventually the bombers came into sight. Three boxes in close formation, each box covering the sky to something like 2000 feet in each plane. When we had first sight, one got the impression of an aerial tank, massive, imponderable, unstoppable, as they slowly advanced across the wide blue towards the coast and home. As they came closer, some small dots could be seen diving and climbing around the flanks. Enemy fighters trying to make an impression on this formidable mass. Ray (Squadron Leader Ray Harries 91 Squadron CO) was leading of course and itching to get to grips, but the controller would have none of it, and insisted we maintain our position. As the formation came closer, the enemy fighters seemed to depart. I suppose they had seen us as we had seen them. We were still being vectored inland just behind Le Havre, with Ray frequently calling for permission to go in deeper, only to be denied. Then the "controller" came up and said "I have a big friend who is in difficulty" He then gave us a course to steer which took us towards the Channel and away from potential action. Ray had a "moan" then turned the squadron onto the heading and very shortly we saw our "Big Friend", a B17, and indeed he was in difficulty. 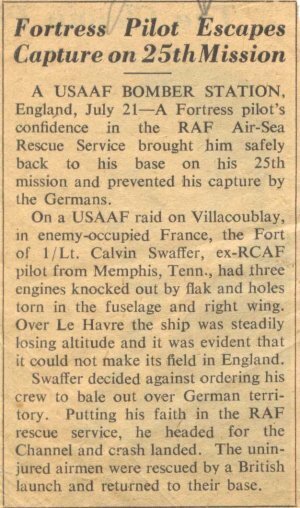 I should think losing one engine in these circumstances is more then enough, but he had lost two, and in addition was slowly losing height, with a fairly large section of the English Channel still to be negotiated. I should think the occupants were feeling pretty vulnerable at the time, and to find twelve Spitfires suddenly wheeling about no doubt gave some degree of comfort, but there was still a deal to exercise their minds in the immediate future. The bomber was making a slow but noticeable decent from the 5000 feet at which we picked it up. It had something like one hundred miles of Channel to traverse to the nearest point on the British mainland. The weather was fine, and the sea calm, but it was clear to all the onlookers that the crew were going to get their feet wet. We were swinging about in "pairs" around the "friendly" trying to keep out of each other's way, but also not wanting to miss anything that might be happening to the Fortress. It called for some pretty nimble "air work". Ray was keeping the ground stations informed of the progress, and the possibility of a ditching. Unfortunately we were unable to raise the bomber on the R/T as we didn't have it's frequency. God knows how slowly we progressed across the Channel. The big aircraft was down to about a thousand feet, when all kinds of unnecessary goods and chattels began to be flung out from the side exit door. It went on for some time suggesting the crew had scoured the fuselage for anything movable and jettisonable. Regrettably it didn't help much and the wavelets on the surface of the sea got steadily nearer the belly of the "Fort". In the fighters, the fuel situation was beginning to get a little 'dicey'. Ray came up on the R/T to say that he would stay with the bomber, and the rest of us should return to base. He had some hopes. While we had a deal of sympathy with the situation of our American allies, human nature being what it was, there was no way we were not going to be there when it went in. So we kept wheeling about the sky with one eye on the fuel gauge and one on each other. By this time we had crossed perhaps seventy miles of sea and were about thirty miles south of Brighton. The "Fort" was virtually down to sea level and we were in great anticipation of the Final Act. He had to go in. We were short of fuel. The Air Sea Rescue boat was on the way. It was a good day to put down. But would he ditch it? Would he hell. I don't know what they were doing in the cockpit to keep it airborne, but whatever it was it stretched the drama to the absolute limit. It was some ten miles nearer Brighton, with the aircraft so close to the surface that the slipstream from the two propellers was throwing up a fine spray, before the Captain finally put it down. So competently and smoothly, it literally floated onto the bosom of our receptive Channel. A Beautiful "ditch", which brought forth much approving comment and whooping on the R/T between our boys. It had hardly come to rest when a number of the crewmembers appeared on the fuselage and wing. A couple of dinghies were rapidly inflated and in they piled. We of necessity hurriedly left the area for West Hampnett, leaving the approaching Rescue boat to ring down the curtain. The B17 Bomber was Memphis Blues of the 303rd Bomber Group. Their crew turned up in our mess the next day and a good time was had by all. 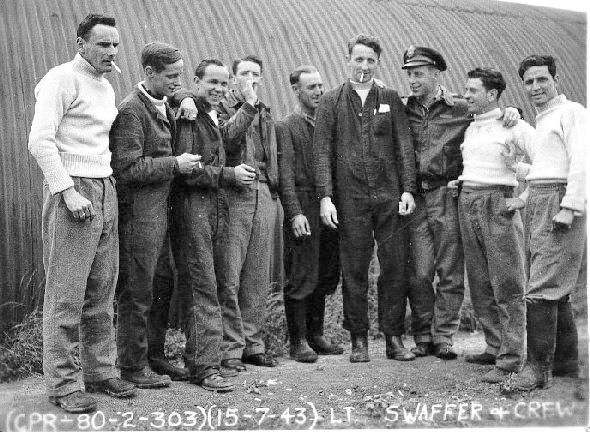 1Lt Calvin A. Swaffer (P) - Was an original 358th BS CoPilot assigned to the 358th BS on 19 July 1942. Previously flew as an RAF Pilot. First mission on 17 November 1942. Dispatched on twenty-two combat missions with the Capt Carl H. Morales crew. Four no-credit missions were aborted (5, 8, 10, 13). Eighteen were credited missions: (1, 4, 12, 14, 17, 22, 23, 24, 26, 27, 28, 31, 34, 35, 36, 37, 38, 39). 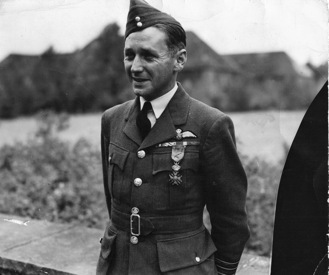 Upgraded from CoPilot to Pilot following the completion of Capt Morales' combat tour on 21 May 1943. Upgrade orders were effective on 12 July 1943, but first mission as 1st Pilot was flown on 25 June 1943. Flew five missions as 1st Pilot with 1Lt John R. Johnston as CoPilot . 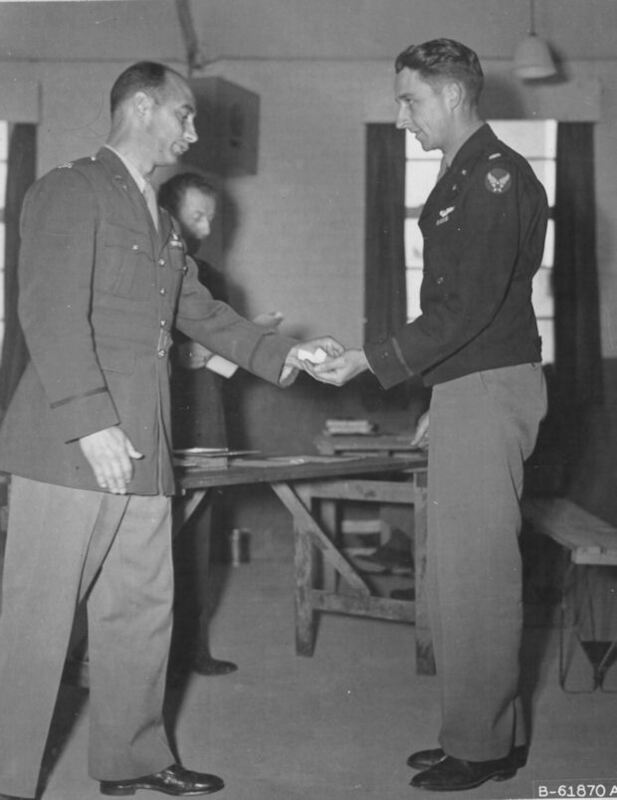 Combat tour completed on 14 July 1943 when 1Lt Shaffer ditched his B-17 in the English Channel. On 14 July 43, mission #50 to Villacoublay Airdrome near Paris, France in B-17F #42-29791 Memphis Blues (358BS) VK-B. Hit by anti-aircraft fire halfway between the target and the French coast, causing one engine to catch fire. A second engine caught fire after being hit by flak in the Le Havre area. Spitfires Protected the B-17 and followed it down as it ditched in the English Channel, 30 miles off Shorham, England, 10 miles from nearest point of French Coast, 20 miles north of Le Havre. All crewmen were picked up by British Air Sea rescue.